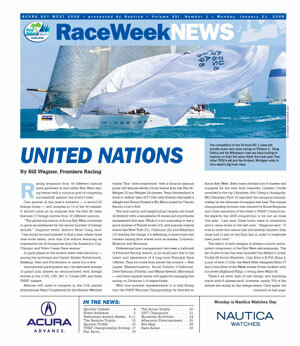 Racing programs from 18 different nations have gathered in this idyllic Key West sailing venue with a common goal of competing successfully against the world’s best. One quarter of this year’s entrants – a record 60 foreign boats – will compete in 12 of the 16 classes. It should come as no surprise that the Farr 40 class features 17 foreign entries from 10 different nations. A quick glance at the scratch sheet tells that story – among the tacticians are Cayard, Barker, Butterworth, Bekking, Isler and Hutchinson to name but a few. International participation isn’t the exclusive domain of grand prix classes as demonstrated with foreign entries in the J/105, J/80, IRC 2, Corsair 28R, and three PHRF classes. Nations will unite to compete in the 11th annual International Team Competition for the Nautica Watches trophy. This “side competition” with a focus on national pride will feature eleven 3-boat teams from the Farr 40, Melges 32 and Melges 24 classes. Team Switzerland is back to defend their 2007 title with Ernesto Bertarelli’s Alinghi and Franco Rossini’s Blu Moon joined by Claudio Recchi’s Let’s Roll. The host nation and neighboring Canada can boast of diversity with a remarkable 35 states and 4 provinces represented this year. While it’s not surprising to see a good number of Florida boats (23), and popular coastal states like New York (31), California (22) and Maryland (17) leading the charge, it’s refreshing to have boats and owners hailing from states such as Alaska, Colorado, Missouri and Montana. Professional race management has been a hallmark of Premiere Racing events, in no small part due to the talent and experience of 4 long-time Principal Race Officers. They too come from across the country -- Ken Legler (Massachusetts), Bruce Golison (California), Dave Brennan (Florida), and Wayne Bretsch (Maryland) -- and their capable teams will again be managing the racing on Divisions 1–4 respectively. The debut of new designs is always a much anticipated component of the Key West extravaganza. The list of new boats this year includes Dan Meyer’s Judel/Vrolijk 66-footer Numbers, John Brim’s R/P55 Rima 2, a pair of new J/122s, the Mark Mills designed Sllim 37 and 2-time Boat of the Week winner Irvine Laidlaw with his latest Highland Fling, a swing keel Wally 80. There’s an even split of one design and handicap starts with 8 classes each, however, nearly 70% of the entries are racing in one design arena. Once again the 46-boat Melges 24 class is the biggest class in fleet , and the J/105’s have an impressive 34-boat turnout. 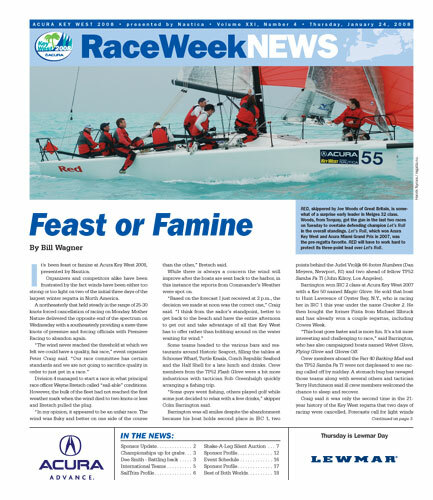 The Farr 40s are starting their earnest preparation for the 2008 Worlds in Miami next April while the Swan 42s will make their Key West one design debut with an impressive 12 boat turnout. Melges 32 growth in this country and abroad is clearly exhibited with their 27-boat showing. These elements and many more are why Acura Key West 2008, presented by Nautica, has attracted another incredible international fleet with the hallmark mixture of grand prix and club-based programs. New this year - the first signal each day will be sounded a half hour later at 1030 and the series calls for as many as 10 races. This course will once again feature three high profile one design classes – the Farr 40, Melges 32 and M 30. The numbers are up in all three classes with nearly 70 boats doing battle on the western most race course. With the increase in boats, a 2-part Starting Line is back in play enabling Legler & Co. to better identify all premature starters and avoid general recalls. The Farr 40 class has consistently been among the world’s most competitive and talent-laden since its debut in 1997. The competition figures to be keen as the owners and teams point towards their 2008 World Championship later this spring in Miami. Equally exciting is the burgeoning Melges 32 class, which has grown from 20 to 27 entries this year and the increase in M 30 participation. FARR 40 (1A) – 25 Boats America’s Cup tacticians Brad Butterworth and Terry Hutchinson matched wits in Valencia this past summer and will do so again this week. Butterworth and Alinghi skipper Ernesto Bertarelli are looking to repeat their 2007 victory while Hutchinson strives to help skipper Jim Richardson and Barking Mad return to World Championship form. Mascalzone Latino, the Italian entry skippered by Vincenzo Onorato, is the reigning World Champion (in fact winning in 2006 & 2007). British America’s Cup and Volvo veteran Adrian Stead will call tactics for Onorato. As usual, the list of tacticians in this class reads like a who’s who of professional sailing with Volvo Ocean Race winner Paul Cayard climbing aboard the California entry Warpath (Fred and Steve Howe) and Team New Zealand skipper Dean Barker joining the afterguard on the German entry Morning Glory (Hasso Plattner). HRH Prince Frederik of Denmark returns to Key West for the second straight season with Nanoq. His Royal Highness will again get tactical guidance from former Volvo skipper Bouwe Bekking. The Farr 40 is the ‘big boat’ in the 3-boat International Team Competition for the Nautica Watches Trophy. 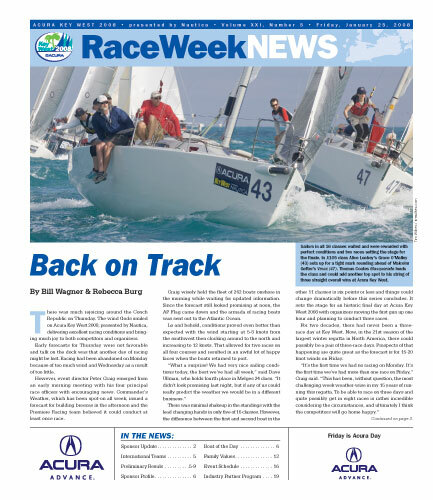 Let’s Roll, the Italian entry skippered by Claudio Recchi, dominated the Florida circuit in 2007 – winning both Acura Key West and the Acura Miami Grand Prix in convincing fashion. Gabriele Benussi will handle tactics on Let’s Roll, which won five of nine races last January. Owner Michael Carroll, helmsman Marty Kullman, tactician John Jennings and the rest of the New Wave crew are back to mount another challenge. They have been joined by a slew of new talent laden teams, many of which are expected to give Let’s Roll a run for its money. The class includes notable owners such as Jim Swartz, Michael Illbruck and Philippe Kahn. All three have fielded top tier programs in big-boat classes over the years and will no doubt bring the same caliber of organization and competitiveness to their Melges 32 campaigns. America’s Cup and Volvo vet Kimo Worthington is tactician for Swartz, who raced his Swan 601 Moneypenny in 2007. Etchells class legend Jud Smith will assist Buffalo resident Bob Hesse on Lake Effect while Harry Melges himself will call tactics for Jeff Ecklund on perennial contender Star. Chris Rast, who will team with Tim Wadlow to represent the United States in 49er class at the Beijing Olympics, is tactician on the New York entry Dark ‘N’ Stormy (Edward Tillinghast). The Melges 32 replaces IRC as one of the classes in the 3-boat International Team Competition for the Nautica Watches Trophy. Team Bold, Groovederci and Turbo Duck have all captured Key West class honors in the past and figure to pace a strong fleet that has grown from 10 to 15 boats. Class President Nelson Stephenson broke a lengthy drought by steering Team Bold to victory in 2006 while Deneen Demourkas sailed Groovederci to the title the previous year. Those perennial favorites should see stiff competition from the likes of Black Seal (second on 2007 North American Circuit Championship) and Illusion (Ullman pro Max Skelley is tactician). An interesting newcomer to the class is Rhumb Punch, owned by John Edwards of Solomon’s Island, Md. Edwards is a long time Key West player and multiple winner aboard his J/29 by the same name. He’ll have tactician Clarke McKinney and his regular crew to help with the transition to the M 30 after purchasing USA 41. The composition of the Division 2 fleet has varied quite substantially over the years. This week it will be the only course with PHRF, IRC and One Design racing. This race circle, located just west of the main ship channel, features a diverse group of boats ranging in size from 30 to 80 feet. Dan Meyers will have tactician Hamish Pepper and a core crew from 2-time America’s Cup champion Alinghi onboard his newly-launched IRC 66 Numbers. The Judel/Vroljik design debuted at the IRC East Coast Championship in November with a runner-up finish to John Kilroy’s TP52 Samba Pa Ti. Meyers captured IRC1 class honors last year aboard his Farr 60 Numbers. He’ll have his hands full defending in a loaded section that includes John Brim’s new R/P 55 Rima 2, 2007 IRC2 class winner Colm Barrington (Dun Laoghaire, IRL) with his J/V 52 Flash Glove and five TP52’s in various configurations. Kilroy has Peter Holmberg as his tactician and has optimized Samba Pa Ti to the IRC rule. Highland Fling, a swing-keeled Wally 80, should attract some interest as there’s been no boat quite like it in the 21-year history of race week. The Key West debut of this Nautor-built 42-footer came in the form of Esmeralda (hull #1) last year. Amelia, owned by Alex Jackson of Riverside, Conn., captured the inaugural United States National Championship. Newport-based pro Brad Read will call tactics for Jackson. Bandit, Andy Fisher’s entry which took class honors at the Swan American Regatta, is another top contender. Three brand new Swan 42s – Vitesse (Jon Halbert, Dallas Texas), Long Echo (Barry Sampson, Southampton, UK) and Apparition (Kenneth Colburn, Newport, R.I.) – will make their racing debut on Monday. Wairere, a Thompson 30 skippered by Pete Hunter of Kill Devil Hills, N.C., is defending champ in the top PHRF class. Hunter and longtime friend Jay Price have been competing in Key West since 1992 and are no strangers to the podium. Newcomer Gwaihir, is the scratch boat, featuring a significantly faster handicap. This Rodger Martin 40, also referred to as a Class 40, was designed for double handed racing. Spaceman Spiff, a 1D35 owned by Abigail Ruhlman (Cleveland, Ohio), was runner-up in PHRF 1 last year. Three Farr 36 designs will be joined in PHRF 1 by James Madden’s J/125 Stark Raving Mad with Gary Weisman calling the shots. Scratch boat Murka 2, a Swan 45 based out of Hamble in the United Kingdom, will have an accomplished owner-driver in Russian-born Mikhail Mouratov and a notable tactician in Eddie Warden-Owen, team coach for the Desafio Espanol America’s Cup syndicate. J/Boats’ latest design - the J/122 - will have 2 entries in IRC 2 along with one of their older designs, the J/44 with long time competitor Jim Bishop and his GoldDigger team. 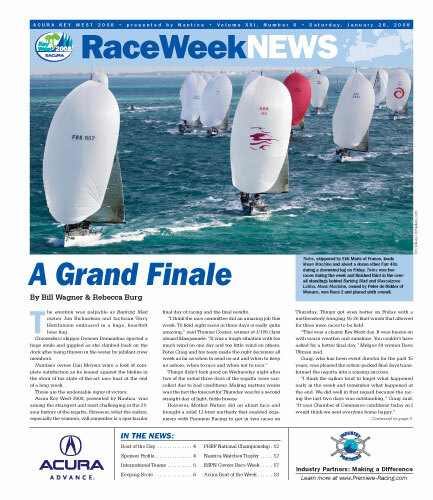 Jim was the runaway winner in IRC 2 two years ago in Key West. This handicap class of medium-sized, moderate displacement boats features a tight rating band and is sure to have some very close competition. Stephen Tedeschi’s Tastes Like Chicken leads a list of four J/109s, which will be racing in one-design configuration with their smaller jib and spinnaker. Emocean, a J/120 owned by Will Hanckel (Charleston, S.C.), was runner-up in class last year - five points off the pace. Bounder, a Sydney 36 owned by David Hudgel (Detroit, Mich.), has done quite well in this regatta over the years. A pair of Beneteau 40.7’s and the C&C 115 Primal Scream round out the small boat class in Division 2. The J/109’s will also be competing for ‘sub-class’ trophies, with the top boat recognized daily and for series. 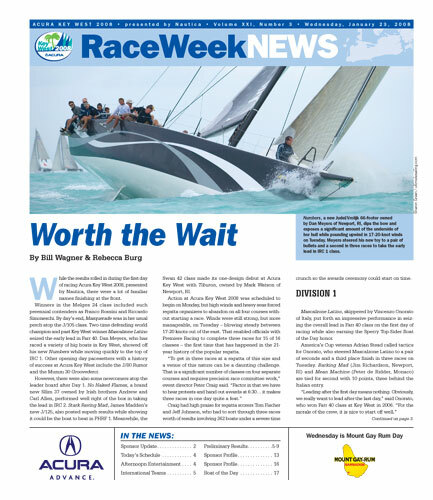 Division 3 will again feature great one design racing with the Melges 24, J/105 and J/80 classes. This race course, just east of the main ship channel, maintains bragging rights as the biggest division in the fleet. Big fleets can create unique challenges for Brennan’s Miami based team – one that includes several members of the Storm Trysail Club. As in years past, Brennan will use a 2-part Starting Line. While the Melges 24 class continues its reign as largest class in Key West, J/Boats has a great presence with their popular J/105 and J/80 classes totaling over 50 boats. This exciting sport boat always has quality to go along with quantity. Defending champion and reigning Acura Boat of the Week champion Giacomel Audi Racing, skippered by Riccardo Simoneschi of Italy is back. Simoneschi and crew placed first in the ninth and final race of the series to vault from fourth to first in last year’s 47-boat fleet. It was a dramatic move as the Genova entry prevailed in the most competitive, closely contested class in fleet last year. Newport Beach (CA) sailmaker Dave Ullman, the 2006 winner, will no doubt be in the thick of things. Blu Moon, a Swiss team led by skipper Franco Rossini and helmsman Flavio Favini, is a perennial contender. Cujo, a British entry skippered by Tony Wetherell has Simon Hiscocks aboard as tactician. Wetherell was once a top tactician in the Melges 24 class while Hiscocks is a double Olympic medalist. Another notable skipper is Norwegian Lasse Kjus, a famous skier who won the World Cup twice and an Olympic gold medal. The Melges 24 is again one of classes in the 3-boat International Team Competition for the Nautica Watches trophy. The second largest class in Key West can boast of 34 boats hailing from 14 U.S. states, Bermuda and Canada. 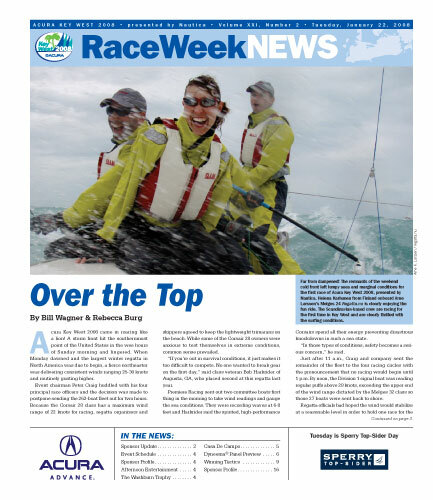 San Francisco skipper Tom Coates and his outstanding crew on Masquerade have captured the top spot at Acura Key West for 3 straight seasons. Convexity, owned by Donald Wilson of Chicago, was a close second a year ago and will look to get over the top this week. Max Power, skippered by Gerrit Schulze of Cape May, N.J., was third in 2007. Other perennially strong contenders include Savasana (Brian Keane, Marion, Mass. ), Gumption 3 (Kevin Grainger, Rye, N.Y.) and Grace O’Malley (Alice Leahey, Los Angeles, Cal.). This popular one design class includes three foreign boats among its 18 entries. The racing sets up as a battle royale between veteran skippers Kerry Klingler (Larchmont, N.Y.) and John Storck Jr., (Huntington, N.Y.). Klingler, a professional with UK-Halsey, steered Lifted to a six-point victory over Storck’s Rumor last January and recently captured the North American Championship for the second straight year. Tactician Erick Storck, a four-time All-American and two-time finalist for College Sailor of the Year while at Dartmouth, will steer Rumor while brother John Storck III will call tactics. Swedish skipper Magnus Tyreman placed third at this regatta last year while U.S. class secretary Kristen Robinson of Annapolis took fourth. Historically, Division 4 has been home to the fleet’s smallest handicap and one design classes. This eastern most course just south of Stock Island typically features some of the most closely contested classes with many top tier club-based programs from across the country. Wayne Bretsch and his core Chesapeake Bay based race committee will manage the racing for four PHRF classes and the Corsair 28R trimaran class. The PHRF entries on Division 4 range in size from 24 to 40’. Among the more spectacular sights at Acura Key West comes when the wind blows in the teens and these speedy trimarans reach along at incredible speeds. Entries include one from the Netherlands and another from Canada. Bob Harkrider, a class veteran from Augusta, Ga., is a perennial contender, having placed fourth in 2005 and 2006 then second last year. Peter Katcha (St. Petersburg, Fla.) and his Relentless crew return after finishing third a year ago. Steve Marsh won the National Championship last year in Key West. This week Marsh will be tactician on Robert Onsgard’s Fifty-Fifty. This light displacement class features smaller boats 28’-33’ in length. Temptress, the SR-33 owned by Robert Hibdon of Charleston, S.C., figures to be a key player after placing second in class two years ago. Henry McCray, a highly-respected sailmaker with Quantum-Charleston, will call tactics on Temptress. Rick Hamilton and his Annapolis-based APY Syndicate and Amadeo Vaccani of Switzerland will be racing a pair of Esse 850’s. PHRF 3 also includes a pair of Hobie 33’s, a new Columbia 32, an Olson 30 and an Evelyn 32. A medium displacement class with mid-size boats, this 9 boat class has a narrow 24 sec/mile rating band. Pipe Dream XIV, a Trip 33 skippered by Scott Piper, of Miami, Fla., was runner-up in this class a year ago. Stewart Delisser will handle tactics for Piper. Jim Hightower of Houston, Tex. returns to Key West with his Dickerson 37 Hot Ticket following a two-year absence. Five J Boats -- two J/35’s, two J/92s’ and a new J/100 (Robert Armstrong’s St. Croix entry Bad Girl) -- join a Cape Fear 38, Tripp 36, and C&C 37/40 WK. This “MORC like” class features smaller to medium light displacement boats. L’Outrage, a Beneteau First 10M owned by Bruce Gardner of Annapolis, is a two-time class winner at Key West. Gardner posted bullets in six of nine races en route to victory in PHRF 5 two years ago. Bert Carp is always a strong contender aboard his Donovan 27 named Remedy. Carp placed third in class in 2007 and 2005. Flak, an Andrews 30 owned by Adam Farkas of Toronto, is a new entry to Key West that performed well this past summer on the Great Lakes. Key West veteran Ken Schram and his Michigan based T-10 Britsar, join fellow mid-westerner Kris Fredrichsen (B-25 Tribute, Sheboygan, Wisc), a J/29 and a second Andrews 30. The “small boat class” in Key West is never short on talent or competitiveness. With a 30 second rating band, this class should feature some tight racing. Key West local Mark Milnes is back after winning J/24 sub-class honors last year aboard Blah, Blah, Blah. A pair of Wyliecats, three S2 7.9s and three J/24s set up some fun “level racing” scenarios within the handicap competition, but they’ll all have to watch for the first Key West appearance of a Colgate 26 and Key West regulars in the Elite 30 Wildwood Flower and the Mac 30 Caribbean Soul 2. Few skippers are coming as far as Peter Fischel, a Seattle resident who works for the National Oceanic and Atmospheric Administration. Fischel serves as skipper of the John N. Cobb, a 95-foot research vessel that works out of the Auke Bay Lab in Juneau, Alaska. Fischel has been competing in Key West since winning the J/24 sub class aboard Rumblefisch back in 1999. “Key West is always a great experience and that is why we keep coming back. It’s a great place to race and have a good time,” Fischel said.